I’m both new to this forum and to flashlights in general. I don’t anticipate becoming a collector, but then I said that about precision spinning tops too, ha! I look forward to your help in finding three lights for very different applications, and hopefully they will be out there without much compromise. In anticipation of the search I bought a couple small edc flashlights, and man what a cool new world! I love those little things. By the looks of it, many of you build and modify. I’m not ready for that I don’t think, but will learn if necessary to get the lights I need. Nice to read here that almost anything is possible. So thanks in advance and I’m sure that with your help, I’ll arrive at good decision points. Have a great weekend. IMHO, the BLF A6 is a great flashlight to have in your collection. Here's a good YouTube video review. But please don't pay more than $20 for it. Both the black and non-anodized versions have been on sale at Bangood for less than $18.00. Keep an eye out for good BangGood sales posted by Fin17. And welcome aboard! Welcome and congrats on the Governor’s race. In CA on the opposite side of the country we are in trouble…. I sell lights occasionally and get you pretty good deals here in the US. The ThruNite opens at last setting. Good, but not enough power to blind an attacker in my opinion. Wife took local women’s self defense course and hope she doesn’t practice on me while sleep walking. She’s good alright, but a non-contact encounter would be ideal. A small light that always come on with maybe a 1000 lumen strobe or better is what I’m looking for, I think. Again, I’m new at this. Don’t need to blind a Vulcan, just stun a bad guy. Any thoughts? Should I move the request to one of the other forums? Whew, out of breathe already. I need to start working out. Thank you ChibiM, and thanks for the eneloop data. I don’t know what it all means, but I’ll study it for sure. You can get the A6 and battery for a great deal!!! I second the A6, its an amazing light. Especially in 3D tint! I hope you enjoy your stay, fourbyfive! 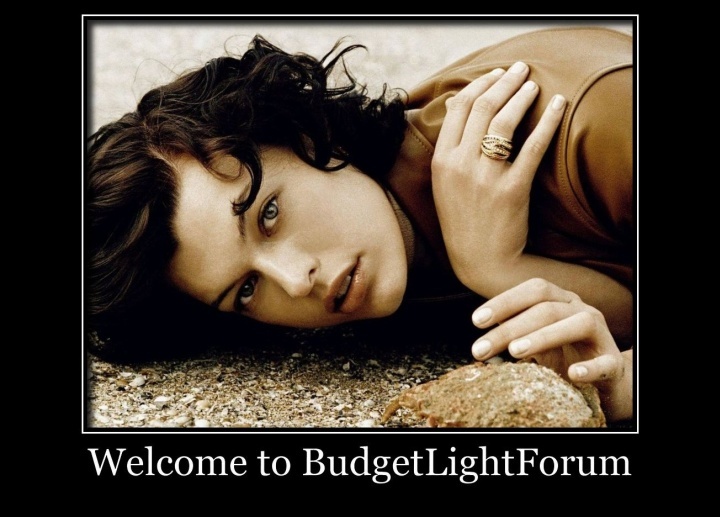 Welcome to the forum fourbyfive. It's clear you have already been bitten. Best wishes on not collecting. Please watch out for being drawn into making political comments. Such comments are prohibited here. I understand that it's hard to resist. I've been guilty of taking the bate too, but I'm not proud of it. We have a really good situation here and violating the rules is disrespecting the owner/founder of this forum. Regarding a light that can be used to help in self defense. I would recommend small tailcap switched light that has a direct-drive ("DD") type driver and a direct thermal path ("DTP") base under the emitter(s). Small with a clip so that you can have it handy with whatever you are wearing. An 18650 tube light with a strong cell will have the power to deliver all the punch you want and more, but may be too big for your situation. Then just bypass the driver so that you have no modes. Last thing you want to do is pull the light on an aggressor and have the light come on in low mode. I don't have a specific light recommendation off the top of my head, but hopefully someone helps out. Hi Al, and thanks for the welcome. 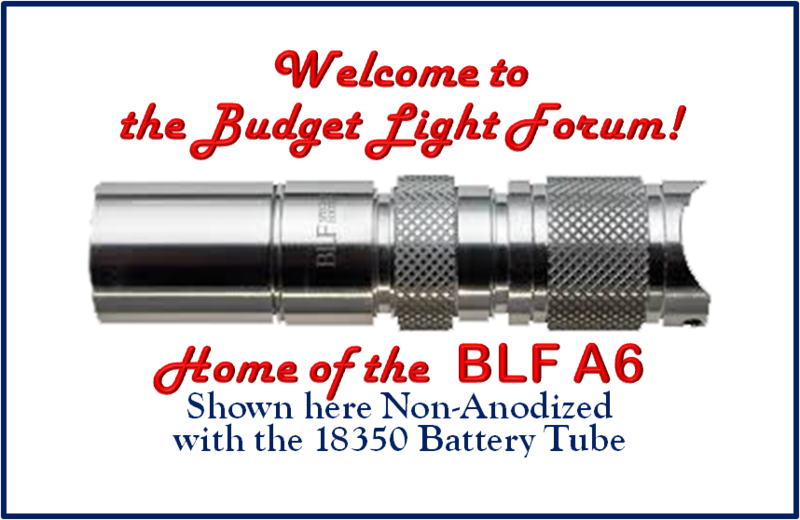 The BLF A6. Well, wish I had come here before buying those other two. $28 at banggood right now. Really nice light. I need about four, one for me, three for Santa. At your behest I will wait on a price drop, which might foil the Xmas idea. While on the subject of small lights, I’m looking for a light my wife can carry that can be activated on high (light or strobe) within seconds, without having to look at it to find a button. We innocents only have a brief moment to mount a defense against ambush. I guess I would like to have something like the A6 myself frankly. Could the A6 be setup for that scenario? Currently I have: ThruNite T10 V2 Lumintop Tool AA 2.0 The lumintop always re-starts with the next light level. Not good for self defense The ThruNite opens at last setting. Good, but not enough power to blind an attacker in my opinion. Wife took local women’s self defense course and hope she doesn’t practice on me while sleep walking. She’s good alright, but a non-contact encounter would be ideal. A small light that always come on with maybe a 1000 lumen strobe or better is what I’m looking for, I think. Again, I’m new at this. Don’t need to blind a Vulcan, just stun a bad guy. Any thoughts? Should I move the request to one of the other forums? Whew, out of breathe already. 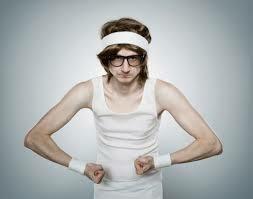 I need to start working out. Using a strobe as a defensive weapon is not in my repertoire. But I do carry a Thorfire TG06S !4500 flashlight that always come up in High and has strobe mode available with a double click. Performance characteristics are tabulated below. BTW, don't pay more than $10 for this flashlight youngblood! I noticed some great deals for it this evening on eBay. Double tap to activate strobe. 96 20 37 SMO No memory. Always starts in High. Others can advise you much better than me on using light as a defensive weapon. I hope they chime in. ImA4wheelr. A thousand apologies for the politics. That fellow kind of set up the new guy, and I just want to fit in. My weakness, and that will be end of it, the politics I mean. Your idea on a light for my wife sounds great, though over my head technically. In fact, any light she uses would best be on/off only. Modes would frustrate her. I will give this some thought, then ask some questions over in the mods forum. I suppose I could take one of the two aa’s I just bought and experiment. If it attained maximum smoke condition, I could still retire on schedule. I think an 18650 style would fit in her purse just fine. Great ideas, and thanks! Al, man, so many cool flashlights. Must hide the credit card from myself. PWM??? So that’s it. I couldn’t figure it out until just now. Some of these lights are driven by pwm? I was shining the ThruNite at a spinning top and began seeing all sorts of wild geometric patterns. Oddly, it only does this on the middle power setting. It’s kind of like an automotive timing light, but a hundred times faster. The Lumintop aa doesn’t do it at all. Anyway, it’s quite a show! PWM, brilliant. And thanks for the Thorfire notes.
. . . Your idea on a light for my wife sounds great, though over my head technically. In fact, any light she uses would best be on/off only. Modes would frustrate her. I will give this some thought, then ask some questions over in the mods forum. I suppose I could take one of the two aa’s I just bought and experiment. If it attained maximum smoke condition, I could still retire on schedule. I think an 18650 style would fit in her purse just fine. Great ideas, and thanks! Bypassing the driver on a 2AA light driver would likely not give you the output you desire. Most 2AA lights have a driver that boosts voltage to power the LED. Bypass would limit voltage to the emitter to whatever the 2 AA cells could deliver. One solution that comes to mind that wouldn't require the light to be modified is the Solfirn SP31 V2. It has 2 switches. One in the tail that completely cuts power to the driver. What ever mode the light is in when turned off at the tail will be the mode the light comes back on. It does so reliably. So if one turns off the light in High Mode, it will come back on in High Mode. 1200 lumens should be adequate to temporarily dazzle an aggressor. The side switch is used for changing modes. The light will be on sale for $19.24 on 11/11/18. Solfirn has a $1 off coupon always available. So using that will bring the price down to $18.24. I'm sure there are better options available, but that is all that springs to mind at the moment. If you are looking for an EDC light, there is a new offering from Thrunite: The TC15. It’s 2,000 lumens, very nice controls and is easily the brightest EDC light on the market. I’ve had mine for a week and LOVE IT! It has quick double click access to Turbo. If you’re buying Christmas gifts, look at the Nitefox UT20 or the Sofirn 32A. With a coupon they are around $20 with on-board charging for the Nitefox and a cell & charger for the sofirn 32A. In fact, if you PM Sofirn Tracy or Nitefox on this forum, they will provide a special one time code for Amazon and the lights will ship PRIME 1-2 day from within the US. My replacement recommendation for your TC10 would be a XHP35 based light around 1800 lumen. There are so many offerings that I can’t list just one. Fitorch M30 or M26, Klarus XT12GT, and Skilhunt M3PRO would be top choices! Welcome. This is a great place. Every decade, the cost per lumen (unit of useful light emitted) falls by a factor of 10, and the amount of light generated per LED package increases by a factor of 20, for a given wavelength (color) of light. It is considered the LED counterpart to Moore's law, which states that the number of transistors in a given integrated circuit doubles every 18 to 24 months. 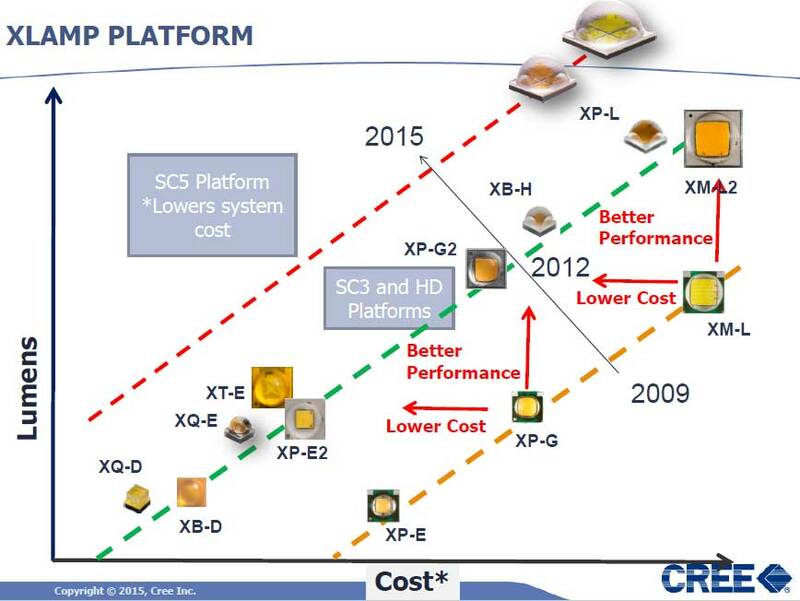 Now, three+ years later, the Cree XHP35, XHP50.2, and XHP70.2 LED are among the latest generation. So the price versus performance sweet spot may lie in a flashlight that has a LED from the previous generation. For example, the XP-L HI or HD. Just talking, one newbie to another. bhstinger. I went to fin’s list and ordered an A6 3D. Thanks. Quite a rundown of light discounts. Wonderful. ActiveAl. Interesting collage of information! I’m learning things…. so I guess that means you’re a professor maybe. If not you should be. I suppose one could continue waiting for the next best thing, but then one wouldn’t have anything to light up the way ahead. Your cost/performance analogy is the way to go. The second newest emitters should be the best value, or at least good value. This is good information which hopefully will keep me from buying 20 lights to find the 4 that I actually need. And who can afford that Thanks man. I appreciate it. ImA4wheelr. I wasn’t thinking of giving my wife the experiment. I do like to tinker and if it blew up it wouldn’t be the end of anything except a small light. If it worked I might have confidence to try something on a higher lumen model for her to carry. Notwithstanding, the Sofirn is a strong candidate for a purse light! That strobe mode is wicked in the video. Thanks to you and the others, I have enough information to go ahead and get her something that will work without further tinkering. Thanks for the options. As mentioned earlier, I would like to get some friends a light for Xmas. 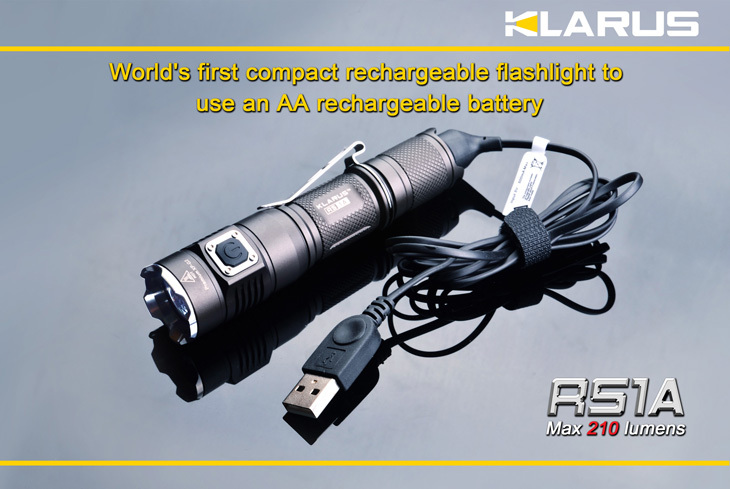 Recipients will know nothing of edc anything, so I would like to get them a light that can be recharged usb without having to take out the battery each time. Battery included is a must. I like the 18650 size. Do you have any suggestions? It wouldn’t have to be ipx8 or anything, just so a bit of rain won’t kill it. This is going to be great. I guarantee that the lights in their kitchen drawer are d-cell klunkers from 20 years ago. The light they get will be a third the size and tens times brighter! ActiveAl. Interesting collage of information! I’m learning things.... so I guess that means you’re a professor maybe. If not you should be. I suppose one could continue waiting for the next best thing, but then one wouldn’t have anything to light up the way ahead. Your cost/performance analogy is the way to go. The second newest emitters should be the best value, or at least good value. This is good information which hopefully will keep me from buying 20 lights to find the 4 that I actually need. And who can afford that!?! Thanks man. I appreciate it. There are many BLFers that are willing to share with those that are interested in learning. Yes, pace your purchases so that your flashlights don't all go obsolete at once! In ten years what you buy today will look pretty wimpy! …or perhaps check out the website, you might find something interesting aside from this.